I know everyone's seen this, but I really haven't watched as much but this just struck me -- is it just me, or does Tammi's chest start turning crimson red right before your eyes as the prosecutor is telling the jurors she's a liar. Her face and neck are not red -- just the chestplate. This happens to me when I get very upset about something - either furiously mad or emotionally upset. This is a physiological reaction that she obviously cannot control and is having a reaction to what is being said that she cannot reply to. She is having to remain composed so her stress is manifesting itself in other physiological ways. Freckles wrote: PD told Logan what would be released to public including his record. TS said she met EJ and grandmother at airport; det never heard this before. But this is not new information, right? That's one of the very first things we learned in this case when TS came onto the scene -- I remember reading eons ago when the story first broke that TS met EJ at an airport, ES was crying because she had this baby she did not want and according to TS that's when they started talking. So why is the det saying they never heard this before? Forgive me, I haven't followed the case in a while so maybe I missed something. Astute observation, Sto! Another "tell" is she also "clears her throat" before answering a "delicate" question. State just finished their closing arguments. Laid out clearly and concisely using a day by day timeline reinforced with text messages, phone calls, interviews, testimony...I thought the State did a great job! I've watched a lot of this trial, but the evidence even overwhelmed me the way they laid it out! I think it was that the grandmother was there at the airport, and not just EJ. Freckles?? Freckles wrote: Final jury instructions tomorrow. Great job Freckles....now everyone who wasn't able to watch the proceedings have a comprehensive review of today's testimony. Thank you - You rock!!! OH! I thought they had already started deliberating. Vinnie P is reporting on the case now. Analyst are saying Tammi "present's well." imo, she stressed me out just to watch, that incessant talking reminded me of Cindy Anthony, it was exhaustive. She, imo, just seems to be so freaking manipulative, if I sat on that Jury, I would vote YES! guilty! I'd fly to Orlando to watch Cindy Anthony & Tammi have a smack down, they could argue about who LIED the most in their Court appearance or who had the better performance! Both women are liars, tenasious, manipulator's, & can cry on cue, it's tough, but I guess my money is on Cindy Anthony although Tammi had bigger aspirations in her life including all her talents, colon therapist, county music singer & writer, a minister, Drama Queen, step mother, the list is endless. Tammi doesn't even have a foundation, Cindy used to but ellejay reported it is now defunct. Chickenbutt, I watched most of the trial on IN Session but was gone today to the Dentist! YIKES! I'm glad they are through w/the jury instructions, so, tomorrow they actually do start deliberating, is that correct? I hope they have made a decision by Friday. Beth Karas tweeted that one of the 4 males was chosen as the alternate and was disappointed. She also said that they have to finish by 5 o'clock local time as the court house will close. The judge told the jury that they are now on their (the juries) time. They can deliberate as long as they want, go home when they want and come back when they want. FYI, KPHO is replaying the closing stmts. Those Analyst need to be fired then. I cannot believe they said that! The rest of your post about TS and CA cracked me up! Chickenbutt wrote: The judge told the jury that they are now on their (the juries) time. They can deliberate as long as they want, go home when they want and come back when they want. FYI, KPHO is replaying the closing stmts. The judge also told everyone to be close today and tomorrow in case of a verdict. The def atty said TS is about 40 mins away and the judge said she needed to be closer. So Tammi will have to come and hang out tomorrow if they don't reach a verdict today. In Ventrilo, we thought TS should rent a trailer and stay all nite. Beth Karas just tweeted that jurors going home for the night. Will be back in tomorrow at 10:30 their time and 1:30 EST. Remember: Read these tweets starting at the bottom. InSession Jury in the #TammiSmith case are now in deliberation. InSession Juror number 3 was selected as the alternate juror in #TammiSmith trial and won't be able to deliberate on the case. InSession #TammiSmith trial is back up on CNN.com/live; Prosecutor giving rebuttal closings. InSession #TammiSmith trial back from lunch. Defense giving closing. Watch live at CNN.com/live. InSession Prosecution just finished w/closings. Court in recess for lunch. After lunch, Defense will start w/closing arguments in #TammiSmith trial. InSession According to State, #TammiSmith wanted to use her attorney to force McQueary to give #BabyGabriel up for adoption. InSession State: #TammiSmith wanted to put Jack's name on the birth certificate of Hoover's baby. You can read these tweets and other media tweets on the Twitter box on the Anthony Portal forum page. It is located on the left side of the page. I love this Twitter box. I check it several times a day for various media updates. InSession tweets lots of updates during trials. The box is titled Anthony Updates. Hopefully, we can get it changed to Multi-Media Updates. J4A set the Twitter box up for us during the Anthony saga. IMO, the state brought Det Ramirez back to underscore specific things TS said or neglected to say to the detective. Whether the detective knew or not is not relevant, imo: it is TS either told cross stories to the detective or she lied by omission. Omission or commission. This is one strange couple. I get the creepy feeling they may have been trying to illegally obtain babies for nefarious reasons. To think Tami approached EJ about Gabriel believing EJ was JUST 16 YEARS OLD! She saw a frustrated mother, believed her to be a minor, and asked her for her baby! And this was not the only time TS tried to obtain babies WHEN MOTHERS WERE UNDER STRESS. Talk to me about how "Christian" you are TS and JS ! You are NOT when you seek to take advantage of misfortune this way. Presents well? She is an emotional vampire! Don't ever cross her as she can get rather testy. She showed us that when State cross examined her. Found it interesting the lack of involvement by hubby, Jack, with the whole adoption stuff, the investigations, etc. I missed all the court today. I wish I could have heard the arguments. Do you know where they might be posted? A vid would be wonderful! Like to see the reaction of TS/JS. Freckles, I missed the majority of it too. If you have Satellite or Cable and can get InSession(Tru-TV), they may play it again tomorrow. I bet they will. Maybe CNN or one of the Arizona TV stations will post a video of it. They have not archived the trial video so I don't know. KPHO and AZFamily - 3TV streamed the trial. I will go and get you the Links to their Homepage and you can look for it. I would think they would at least have Snippets. I would have loved to have seen it, tess! I've been recording the trial but InSession stops their program here at 2 pm CDT. I am hoping they will play the trial proceedings again tomorrow morning. I have it set to record. Tammi Smith looked tense as she sat quietly in her chair during closing arguments. This is the picture that KPHO posted with their article. This is what Tammi Smith looked like when the Gabriel Johnson case unfolded and when she was making all of her rounds with the media. Closing arguments were made Tuesday in the case of Tammi Smith, the woman accused of forgery and custodial interference in the case of missing baby Gabriel. This case is now in the hands of the jury. It has been five weeks of a very complicated trial, centered around 40-year-old Scottsdale mom Tammi Smith and her desire to adopt a baby. 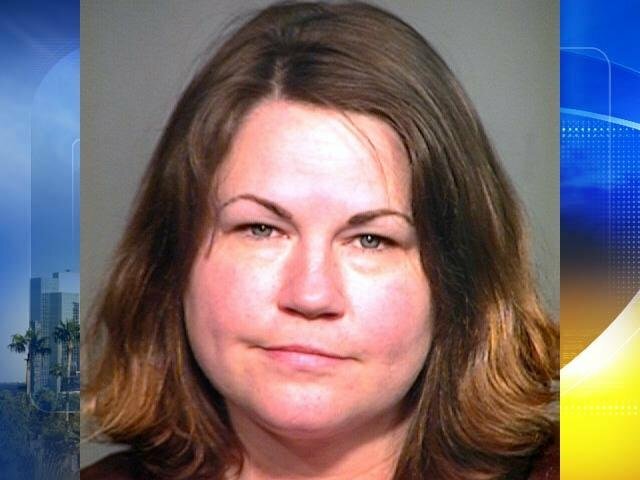 In closing arguments, prosecutor Angela Andrews painted Tammi Smith as a desperate woman. Missed today also, thanks for all the updates everyone. Was mostly a lurker on Hinky, so thanks RC for a new place to share. Tammi is one smooth customer. Her insane need to talk, talk, talk in detail about each answer, had me thinking about that saying about being hoisted on your own petard or something like that. I really wanted to scream at her the few times she answered the cross with demands to be shown transcripts of what she had said and then was allowed to ramble on with her ever changing stories. How any rational person can say she came across well was either not watching the same trial as me or a defense attorney. Ps. What is colon therapy, seriously? Am I living in the dark ages? Yes. It is also called a high colonic.More flushing of the pipes than an enema usually provides. Nothing wrong with it but please, Tami, let's not glorify this any more than getting a prostate examined or a yearly pelvic! There is one HUGE difference, however. Buyer be ware. Would you like a lay person with NO medical training to be messing with your bowels and intestines OR a doctor? Let me put it this way: She screws up and you could have a perforated bowel. And all those lovely toxins could be leaking into body cavity. Too early in the AM for such deep thinking. Need my caffeine. I have to go into work today but I am hoping to return to a guilty verdict! yw, Freckles. I am sorry I could not search those sites for you. I am working on going through all of the pages on Hinky Meter - Refugees thread and looking for the Helpful Info posts I made. I am copy and pasting them on our new Help! Q & A thread. InSession The attorney for #BabyGabriel's biological mother will be on In Session today at 11:00a.m. ET. I just don't think anyone but Tammi ever said "when I grow up - I want to be a colon therapist !" yuckles... but then again I am not in the new age group. Have been having a chuckle over listening to the wordy conversation of KC and Tammi...locked in a room together. When are they going to do something with baby Gabriel's mom? Where is she? cb, thanks for the update! We will have to ask J4A if he will set up a video stream for us above the Live Chat box here. I would think Val won't still have her Ventrilo by then. Good Morning everyone, I am just now having my coffee. I hope we are looking forward to a verdict today. I would think that it won't take long. I thought the pros. closing was excellent. Of course, I missed most of defense because the feed went down, but Beth Karas said she only spoke for 30min. Beth also said she thought it was an effective defense closing. This will be interesting. Elizabeth Johnson's atty. is going to be on In Session at 11:00 (in about 15 min.). He will give opinion on TS verdict and how it could affect EJ trial. tesstruhart wrote: Elizabeth Johnson's atty. is going to be on In Session at 11:00 (in about 15 min.). He will give opinion on TS verdict and how it could affect EJ trial. Tess, would you be able to post a summary of what is said?? I would appreciate it. Also, I am assuming that whatever the verdict that TS will be called to testify in EJ's trial. Oh Weezie, I was called away from the computer and just got back, I missed it. I was watching Insession and didn't see it....perhaps her attorney will be on later. If she is convicted all her character statements will be inadmissable in EJ yrial. He's on now. Marc Victor is attorney, if TS convicted, he will still seek acquittal for his client. He feels that since trials will have two different fact patterns there can be two different conclusions. he really didn't say too much, stating that he certainly couldn't lay out his defense to IS at this point. Well, that was a big nothing. You just never know though. A bombshell could happen, however, if I am watching the odds are against it. Attorney said if TS is acquitted she might be called in the EJ trial and if she testifies then she could have an impact. Then said she might take the fifth because if she speaks it might leave her open for charges in TX. Personally I can't even imagine Tammi taking the fifth and refusing to speak! ishi wrote: Personally I can't even imagine Tammi taking the fifth and refusing to speak! Hahaha....not that she had to underscore the obvious, but even the prosecutor alluded to that in closing statements making the point to the jury that this lady never shuts up! Tammi herself even smiled at that comment.